Good. Trade paperback (US). Glued binding. 576 p. Contains: Illustrations. Audience: General/trade. Good. 0143036556 Ships from Tennessee, usually the same or next day. Fair. 0143036556 Ships from Tennessee, usually the same or next day. Good. [ No Hassle 30 Day Returns ] [ Edition: Reprint ] Publisher: Penguin (Non-Classics) Pub Date: 12/27/2005 Binding: Paperback Pages: 592. My husband, a professor at St. John's Univ., finds this text invaluable in its content and its presentation of material. 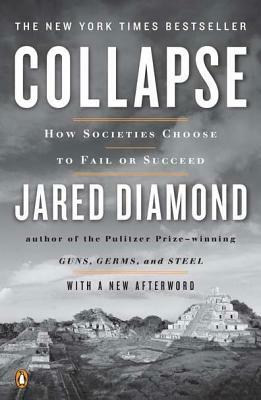 He is cherishing Jared Diamond's book; and when he is done with it, I intend to read it. Because I have interest in the hisotry of Mayan culture, theexposition of it in this book has fascinated me very much. It is worthy of reading. Diamond did not select bits of research findings to support his arguments. The message and the warnings our society should hear are oh, so calmy, cool-headedly exposed and credible. The tragedy-as in all of Diamond's books- is that the people who are the"chiefs", who ask us to build more temples from shrinking resources, was not heard then. Alas it will not be heard now, Very well written and argued, Excellent book. Anybody who saw the recent earthquake devastation in Haiti needs to read Diamond's overview of how and why they had become a place of devastation from deforestation long before the earthquake. It should be a lesson for the world and a preview of disaster when the laws of nature are ignored in favor of profits. I normally read very fast and enjoy reading, but this book puts me to sleep.